Tony DiTerlizzi, author of the popular series The Spiderwick Chronicles, is bringing readers a new fantasy novel called The Search for WondLa. The book hit stores on September 21. In the story, 12-year-old Eva Nine lives in an underground world where she is raised by a robot named Muthr. She has never seen another living person. When an intruder destroys her underground home, she escapes to a strange new world above ground. There she begins a search to find someone like her. A single clue gives her hope—a crumbling picture of a girl, a robot, an adult and the word WondLa. TFK Kid Reporter Sahil Abbi spoke to DiTerlizzi about WondLa and the power of imagination. TFK: Where did you get the idea for The Search for WondLa? DiTerlizzi: WondLa was inspired by some of my favorite childhood heroines. I think back to stories that I loved as a kid and that I still love to this day, like Alice’s Adventures in Wonderland. I loved Wendy Darling, the character who goes with Peter Pan to Neverland. I also love Dorothy Gale from The Wonderful Wizard of Oz. In all these stories, a lone person enters a magical place and gains knowledge before she returns home. In the end, these characters learn to cherish the power of home. I’m glad that kids still love these stories, but I make them a little more modern with lots of cool technology. TFK: What do you like about fantasy? DiTerlizzi: I love books with imagination. Imagination is why Christopher Columbus sailed across the ocean to find America and it is why we went to the moon. I think that imagination is so important and it should be instilled in kids as early as possible. TFK: Did the books you read as a child influence The Search for WondLa? DiTerlizzi: A book that I kept thinking about while I worked on The Search for WondLa was Charlotte’s Web. It highlights these unlikely friendships. There’s the friendship between Wilbur the pig and Charlotte the spider. Then there’s the friendship between Wilbur and a rat. That’s not unlike my character Eva who is being taken care of by a robot, but is also friends with Rovender, an angry alien. TFK: How do you feel about The Search for WondLa being made into a movie? DiTerlizzi: I’m really excited. Paramount Pictures read an early version of WondLa. They totally loved the story and decided to make it into a movie. I’ll probably act as an adviser, which was what my role was for The Spiderwick Chronicles. I helped with the stories and with the visuals. I’m kind of the go-to guy for the world of the story. TFK: Your character Kenny, from the book Kenny and the Dragon, reminded me of myself. Did you base any of your characters on you or someone close to you? DiTerlizzi: That’s awesome! Kenny is kind of like me, too. I was very much a kid who was living in my own world. If I wasn’t reading, I was drawing or outside catching bugs. I think that all the characters I’ve created have little fragments or pieces of me. It’s like you take your personality and throw it at the ground and it breaks into pieces. Then you have to put the pieces together to create different characters, so they’ve always got a little piece of you in them. My characters also have elements of friends and people I know. I’m a lot like Eva [from WondLa]. Yes, she’s a 12-year-old girl, but she’s not really girly. She’s just a kid who is trying to find her place in the world. TFK: Are any parts of your books based on your experiences? DiTerlizzi: When I make my books, I tap into a younger version of myself. I go back and think, “What would the 10-year-old version of Tony want to read that the 40-year-old version of Tony can create?” So I think back to the things that I liked. Even though my generation and your generation are different, there are some things that we have in common. For example, I loved videogames when I was your age. TFK: Is there a message that you want to send young readers through your books? 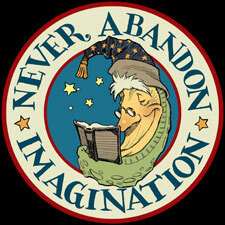 DiTerlizzi: Yes, never abandon imagination. It’s all about imagination. TFK: What did you read when you were younger? DiTerlizzi: I read all kinds of stuff as a kid. I loved books on astronomy, paleontology and insects. I love nature. I am kind of an armchair naturalist. I have field guides on birds and I enjoy copying the drawings. TFK: What advice do you have for aspiring young authors? DiTerlizzi: Keep writing, keep imagining and keep drawing. I am a product of two parents who saw that I was an imaginative kid. They encouraged me and so did my teachers. My advice for adults? If you see a youngster who is really good at making up stories, encourage him or her. We need more of that in the world.